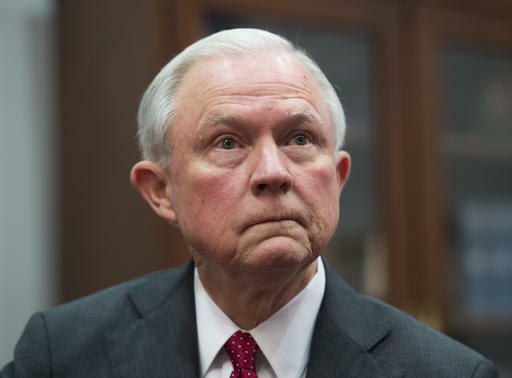 WASHINGTON (CN) – Kicking off a contentious confirmation hearing Tuesday before the Senate Judiciary Committee, U.S. Attorney General nominee Jeff Sessions defended his position on immigration and voting rights. Distancing himself from President-elect Donald Trump’s suggestion that the United States block Muslim entry, the senator said the president-elect has backed off that proposal as well. “I have no belief and do not support the idea that Muslim religious groups should be denied admission to the United States,” Sessions said. The answer came in response to a question from Sen. Patrick Leahy about why Sessions voted against a proposal that would have expressed the sense of the Senate that people should not be barred from entering the country based on their religious views. Sessions said he was against the provision because he did not want to forever bar lawmakers from considering religion at all in immigration law. It would be a “prudent decision,” Sessions testified, to block people from entering the country if they said they were Muslim and that they believed their faith instructed them to kill everyone different than them. In her opening statement at the hearing, Sen. Dianne Feinstein, a newly minted ranking member of Senate Judiciary Committee, highlighted letters of objection to Sessions that the committee received from a number of civil rights and other groups. She said it is “difficult” to go through the process of evaluating a colleague, especially one with whom she has worked for many years on the Senate Judiciary Committee. Feinstein specifically called on her colleagues to evaluate whether Sessions will be able to remain separate from Trump, whom he prominently supported even as many Republican lawmakers kept their distance from the disruptive campaign. Sen. Chuck Grassley, an Iowa Republican who chairs the committee, was the first to begin questioning the Trump nominee. When asked how he would handle a potential investigation into Clinton’s use of a private email server while secretary of state or into the Clinton Foundation, Sessions said he would recuse himself. “I believe that would be the best approach for the country because we can never have a political dispute turn into a criminal dispute,” Sessions told Grassley. 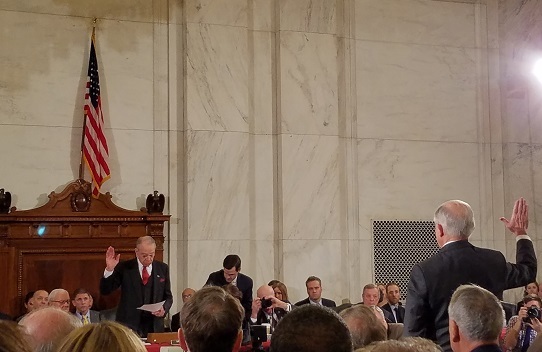 Representing Alabama since 1997, Sessions is one of the most conservative Republicans in the Senate – making him one of the more controversial appointments Trump has made. Democrats have blasted the pick, and one of Sessions’ colleagues, Sen. Cory Booker of New Jersey, is scheduled to testify against him. In an attempt to push back against increased public outcry over Sessions’ civil rights record, Republicans meanwhile have lined up a number of black witnesses to vouch for the senator. Sessions’ reputation as a tough-on-crime hardliner was on full display during his opening statements to the committee, in which he lamented a recent jump in murder rates in cities like Baltimore and Chicago, and the opioid-abuse epidemic sweeping the country. Sessions also addressed the concerns that torpedoed his nomination for a federal judgeship three decades ago, denying he called the NAACP “un-American” or expressed sympathy to the KKK. Sessions said he “abhors” the KKK and detailed his efforts to prosecute to Klan members who abducted and murdered a black teenager. Sessions noted he kept the charges in Alabama so one of the members could receive the death penalty. An immigration hardliner, Sessions has also been one of the most prominent holdouts on a bipartisan criminal justice reform bill that has significant support among Republican leadership. Though he was one of the early supporters of eliminating the disparity between sentences for crack and powdered cocaine, advocates of criminal-justice reform now see Sessions as largely behind current trends on the issue. The public seating at the hearing is largely occupied by protesters, including a row of marijuana advocates and Code Pink, an anti-war fixture on the hill. 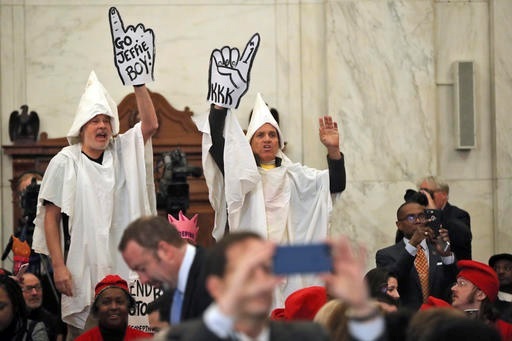 Two men dressed in KKK-style robes stood up and shouted just before the hearing gaveled in before police escorted them from the room. 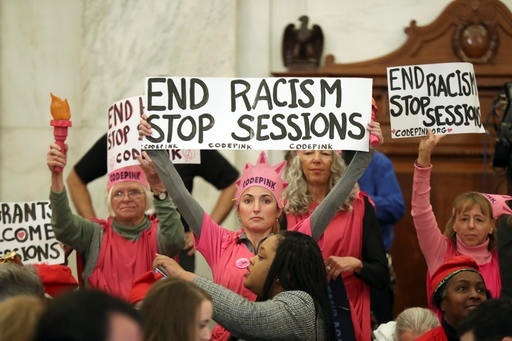 Shortly after Sessions began his prepared remarks, another two men began shouting that Sessions is a racist and that people must take to the streets to oppose the incoming Trump administration. “No Trump, No KKK, no Fascist USA,” the protesters shouted before police removed them from the room. A woman stood up shortly after they left, repeating similar calls and meeting the same fate. Sessions pushed back in his opening remarks against allegations about his zealous pursuit of voter fraud in Alabama, saying the case was about protecting black votes. He further committed to protecting the rights of minority voters, an olive branch to people concerned about Sessions’ praise of a Supreme Court decision that stripped parts of the Voting Rights Act.